Now that's a silly little joke only Dutch (speaking) readers can appreciate. Or those who learned my Dutch/English sewing related translation list by hart. For the rest of you: "rok" is Dutch for "skirt". And of course, black leather is a classic rock chick look. This skirt is made of thin black leather which has been treated to have an interesting matte texture. I bought it as a large and very 80's looking second hand skirt last year (for either 2 or 5 euros, I don't remember which). I chopped off about 20 cm at the top, re-cut the front and back according to my skirt sloper, partially stitched up the very high back slit, inserted a new zipper and re-sized and re-attached the waistband. I chose a metal zipper and inserted it the way you would insert a blind zipper. It's a look I like on leather: no visible stitching next to the zipper but metal zipper teeth on display. Obviously, there is extra material inside at the stitched-up slit so I hope that won't make the skirt misbehave too much. By the way, the hem is at an even length, I'm just posing with a ridiculously arched back in the second picture. PS. Today is your last chance to sign up for the pattern magazine giveaway! Wow, lately it seems like everyone else is sewing and blogging up a storm... I feel like I'm lagging behind. Badly so. The truth is, I've been busy. Too busy to get a lot of sewing done. And then, as soon as I get time to sew, there will be an assignment waiting for me. Work just been quite busy lately. And E had to work another entire weekend, so there are still no better pictures of the jacket. I started of this skirt thinkin it would be both easy and a great opportunity to try out the tiny amount of draping experience I had just picked up at M's. Hm, well where to start? I can't drape skirts at home. Mary still doesn't have legs and she has a posture issue and my normal dummy opens at the sides and center front and back which makes her quite unsuitable for pinning and draping. This meant I had to go with what I already know and start from a flat pattern. Secondly, I hate this fabric. I love the colour and the hand is rather nice too (although maybe not ideal for this project) but it's just so synthetic. I knew it was polyesther, polyesther crepe to be precise, but not all polyesther fabrics are created equal. And as it was very cheap so I thought I could always use it for a muslin. Well, that's what this skirt will have to be. A muslin. Which is why it doesn't have a zipper or facings and why I didn't press it properly. This fabric isn't even worth that name. The stuff creates so much static electricity that I think it's a fire hazard. No way I'm going to wear that. And it frays like crazy. I think I do like it though. 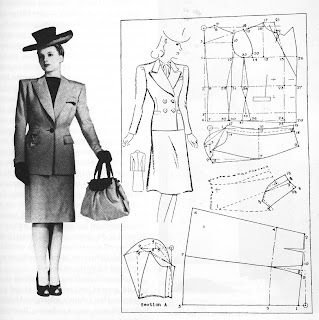 The draped front will have to be smaller because it drags that side of the skirt down too much (not visible in the pictures) but I would just love to have a skirt with a 'fly-away panel' (as they call this feature in vintage pattern describtions, if I'm not mistaken). If you ask me, it's fun and flirty and feminine. Even though it's also difficult to finish properly because both sides of the drape are on display and there's a curved edge (I used a rolled hem from the serger on this muslin, but another fabric might need/allow other methods). PS. Don't forget to enter the pattern magazine giveaway! In your comments to the magazine giveaway, several of you have mentioned the complete lack of sewing magazines in thier countries. From the fairly often heard "We're lucky to get Burda" to "I wish we had sewing magazines here". This shows how spoiled we are, here in the Netherlands. Yes, Dutch seamstresses will also complain about the lack of fabric stores and about how hard it can be to find patterns in the right styles and sizes. However, we have choice of sewing magazines which are available at most newsagents. Of course, there's Burda, which is also published in Dutch. There is Knipmode, a Dutch publication which is also published every month and has about the same amount of patterns per issue. Which also has a separate publication called Knippie which is all about children's patterns. There is Ottobre, for women and for kids. And then there is some smaller, rather more frumpy magazines called "Sandra" something like that. (I don't no how many of that kind of magazines there are. A well stocked newsagent would have three different ones, but I think two of those would be about knitting only). And then, some fabric stores sell FIMI, and its smaller sibling (as in children's patterns) Bizzkids which appears either 2 or 4 times a year. And there's newcomer MyImage and apperently Stitch&Sew as well. And a quick google search also brought up girl sized Trndz. Yes, we are seriously spoiled. Unfortunately, apart from Burda and Knip, I haven't found own websites of any of these magazines to link to. If you're interested: I found the smaller magazines, FIMI, Stitch&Sew and Trndz for sale at this site, which I have no personal experience with. All versions of Knip (including some Dutch/German specials I didn't know about), MyImage and more are for sale at naaipatronen.nl which, in my experience, is a very reliable site. Both websites are in Dutch, but if you email them in English, they should be able to help you. Click the text 'contact' to go to an email-page. Oh, and for any Dutch readers on the hunt for exotic pattern magazines, it seems that both websites are selling Patrones as well. And what about those magazines in the picture? Well, apart from Knip and Burda, all of the magazines listed above are fairly new. There used to be another Burda-like Dutch sewing magazine. It was called 'Marion' and I remember that my mother subscribed to it in the late 80's. Publication stopped well before I started sewing. I didn't really know how long it was around though. And then, my aunt gave me these. She volunteers at a local charity shop and found these issues of Marion. The oldest (the little black-and-white one on the left) is from 1961, then there's one from 1969 and the other 10 are from 1970 to 1972... I'm really happy with these and I'll show you more of them in a later post. 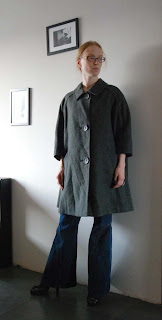 So, to fill some space here, I'll show you the cool vintage coat I found at my usual thrift store - market stall. I don't know how old it is, it doesn't have any tags but doesn't seem home-made either. 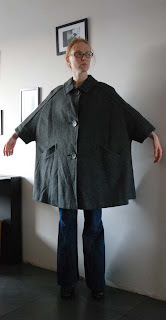 It was labeled as 'one size' because of it's cape-like shape and the sleeves which are obviously intended to be three-quarter length. However, there are shoulder darts and those are about in the right place for me. The coat is made from green/grey wool and lined in wool with a houndstooth check of that colour and off-white. It almost looks like it could be reversible but there is no trick with the buttons to allow for that and the turn of cloth on the collar makes pretty clear to which side it should fold. As you can see, I took these pictures with entirely inappropriate flared trousers, I should press the coat and it may not get worn until after the summer. But, this is exactly kind of quirkily shaped (and more or less my size) garment which I just have to buy when I find it this cheap. Just over a month ago I was lucky enough to visit the fabric trade show Tex World (orginized by the Frankfurt Messe, but held near Paris. And just doable as a one-day trip from where I live) with M (M is the designer of pioneering eco-brand ecocouture. unfortunately, she doesn't have a webshop but on her site you can see some of her designs, some of which sewn up and all the current ones photographed by yours truly). While we were there, we came across a Dutch fabric importer who had some sewing magazines at the stand. Pattern junkies we are, we took those with us. 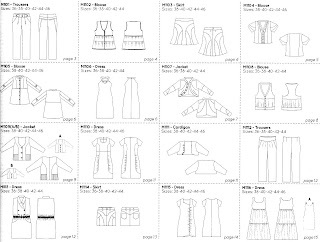 But, pattern making junkie I am, the chance of me actually making anything from these magazines is next to zero, and they don't include any amazingly clever details which I want to look at time and time again. At least, to me they don't. So, I have decided that I should pass these on to a more appreciative audience. These are not full-size magazines like Burda, but I will show and tell you about them. The first one is My Image, which was reviewed here, by Melissa from Fehr trade. I think she might be a better judge of this kind of magazine than I am. Because of her post, I know that this was not a one-of publication in collaboration with a fabric importer, but an actual magazine which appears twice a year. It is published with instructions in Dutch, English, French and German. It contains these designs, all of them either in size 36 to 44 or in 38 to 46. And that's according to this sizing table. The other magazine is called Stitch & Sew and I know nothing about it which is not in the magazine itself. However, to me, the instruction pages, pattern sheets and sizing look a lot like Knipmode's. Stitch & Sew, despite its title and the text on the cover, comes with instructions in Dutch and German only. The other special thing is that it has patterns not just for women but also for kids. For girls and for boys. Am I right in thinking that boy's patterns can be hard to find? Without further ado, these are the designs. Top row is for women, the first four designs in the second row are for boys, the rest for girls. Women's patterns come in sizes 34 to 46, according to this sizing table. Stupidly, the magazine doesn't include a kids' sizing table but all children's patterns are for sizes 104 to 134. 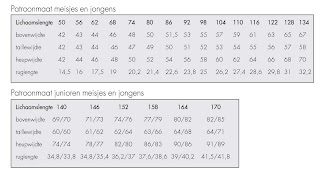 I downloaded this sizing table from the Knipmode website. 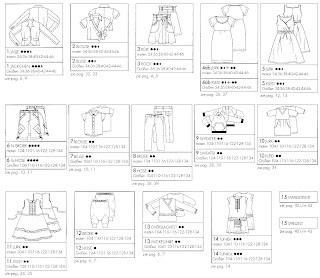 It's for their children's wear publication Knippie, and I think the sizes will match Stitch & Sew's very well (the women's sizing table is an exact match). You can enter until the first of April. 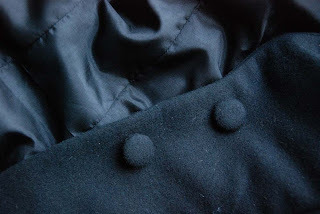 When making the jacket, I didn't take pictures of every step of construction. 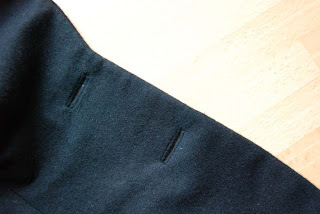 I showed you the dart-and-pocket thing but there are so many tutorials on bound buttonholes, pocket welts and padstitching that I didn't feel the need to add any of my own. So, the details in this post are all on the outside. The pictures don't look great because I had to lighten them to show the detail. But, since I don't think these features would show up in an 'all over' photoshoot (not even in the best of light) I thought they deserved a post of their own. 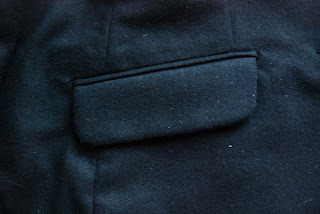 pocket with welts and flaps. My best yet, I even managed to get the welts at the angle. bound buttonholes. 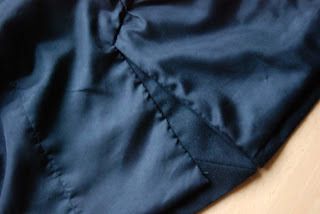 These were made way easier because my sewing machine will automatically stitch the 'window' for a bound buttonhole using the buttonhole foot and a certain setting. That's how I managed to create such narrow welts. fabric covered buttons. Just from one of those 'cover your buttons'-kits. and, just to add an extra touch, piping between facing and lining. It's done. 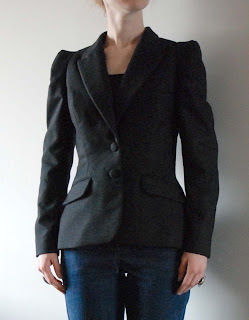 I've finished the jacket. Sure, I will probably give it another pressing and it certainly deserves a more glamorous photoshoot than this one. But the important thing is this: the sewing is all done. I did the final bits of handsewing last night. These are just some quick pictures of it, taken when I came home from work today. They don't show a lot of detail, even after a bit of lightening, but you can at least see the pocket and, of course, make out the silhouet. I hope I can convince E to take some better pictures this weekend (hopefully with matching trousers, but I'm not sure I'll be fast enough at making those). 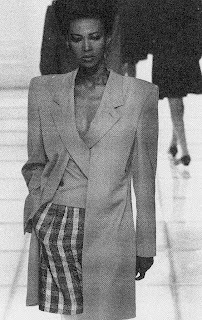 This jacket is all about old-school tailoring. There is horsehair in the front and collar, the hems and also in the sleeveheads, to keep those points up. As a result, there is a ton of handsewing in this jacket, from the basting you've seen, to the padstitching and then some in the hems. 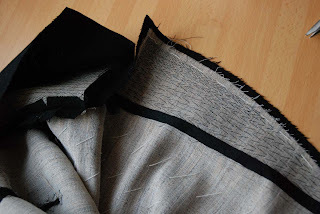 For those, I bagged the lining as usual but then, I pressed the facings, added horsehair on the inside and catchstitched the seam allowances of the facings to the horsehair, while catching threads of outer fabric onto the horsehair as well. Although I can sew very neatly by hand, this was the ideal fabric for it. The dense wool doesn't fray very much and it just doesn't show the stitching on the outside. Over to the state of affairs here then? The jacket is very near completion. 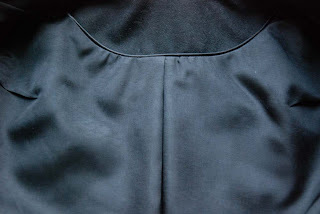 The lining is in, it just needs to be attached at the hems, and the hems themselves need... ehm.. hemming. 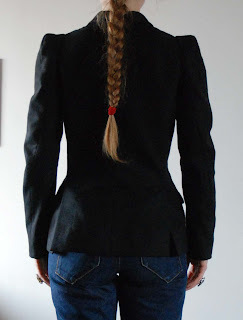 I also still have to attach the facing-side of the bound buttonholes to their front but I prefer to do that last, when the jacket doesn't have to be turned inside out anymore. And then, I'll have to confirm my choice of buttons (or reject them and find others of the same size...) and sew them on. After that, I'll make another jacket, as an assignment from my friend J. I'm finished with the pattern (apart from a little bit of tweaking of the sleeve heads) and we will go fabric shopping tomorrow. I suspect I will squeeze in a quicky skirt and/or knit top at the same time. I am getting rather excited about fabrics and colours for spring. I already found several things in my stash and on sale (like: it-really-must-go sale) at the market which will work well with those of the supposed new trends that I like. done. I will very likely ask your opinions again. 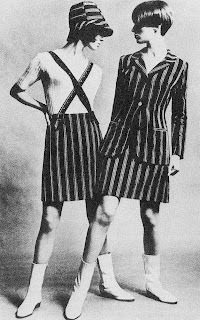 I going to leave you now with some pictures of different fashions in jackets during the second half of the 20th century (which I scanned for a 'jackets throughout history 2' post. However, there's no complicated defining of terms or historical stuff involved now. These were just changes in fashion, so I guess the pictures sort of speak for themselves).